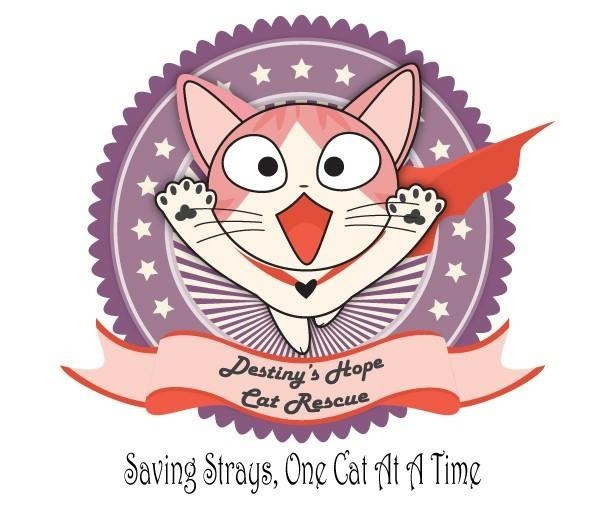 Destiny’s Hope Cat rescue was primarily founded by Sabrina Antonelli, who has been rescuing and taking in unwanted cats on her own for years. Destiny’s Hope was named after her daughter, Destiny, who has been born with a love for animals and has been involved in rescuing since she was a small child. Sabrina, and Christina Pulschen met at an hospital where they worked and have been working together since then. Christina moved to Pennsylvania and continues to rescue animals. When she comes to New York she always helps out! Sabrina and Crystal Cahill met at the same animal hospital where Sabrina works and immediately hit it off. Crystal jumped right into fostering kittens and joined Destiny’s Hope. 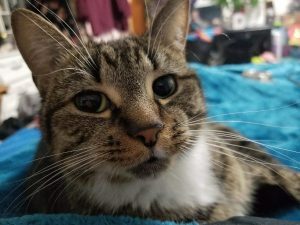 Sabrina and Crystal are currently caring for the cats in their of homes which have been set up as an introductory place for new cats and kittens coming in. We hope to soon have a facility where we can have more room and isolation wards for cats with contagious illnesses. 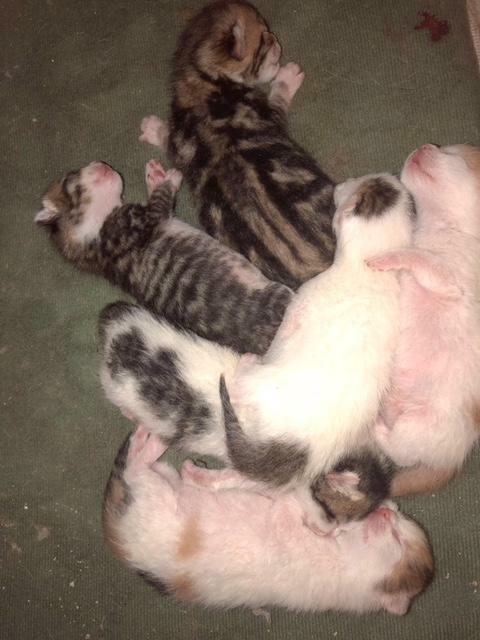 Rose Purcell joined soon after and started fostering cats and kittens. 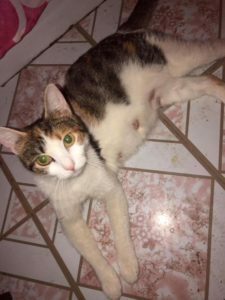 Sabrina, Crystal and Rose provide these cats with medical care and monthly treatments and try not to turn away any cat or kitten due to a medical condition. Our most recent members joined shortly after Krystle Parisi, Sacha Rodriguez, Sydney Ballard and Anne Kelleher. Adam Coste is our special maintence man! He carries the big bags of cat litter and cat food. He helped Sabrina build a nice cat room for all the rescues to enjoy. Destiny’s Hope has made a bunch of people come together to save lives. See some of our cat’s stories for more information on how we helped them and care for them on a daily basis. Destiny’s Hope also helps people in the community who are struggling to take care of their own pets or who have found an animal but aren’t sure what to do. Meet our staff! We are always in need of people who would like to donate their time and talents in the areas of carpentry/handyman, legal advice, or people who would like to help with trap/neuter/release. Also, if you’d like to just make a donation, you can do so easily through PayPal using the link at the bottom of the page. Are you a frequent (or not so frequent) Amazon shopper? 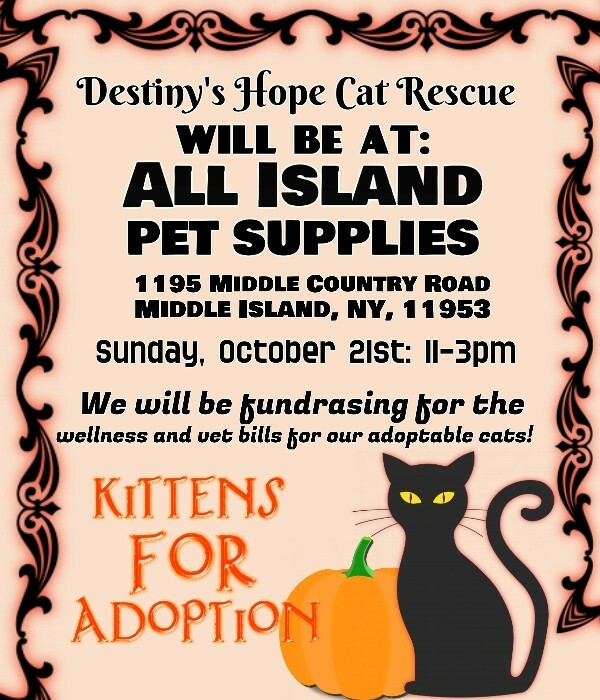 If so, when you go to Amazon, type in smile.amazon.com and choose Destiny’s Hope Cat Rescue as your charity of choice. Use this site every time you shop at Amazon and a portion will go to the kitties. The great thing about it is that you still get all your Prime perks, etc. and it costs you nothing — you do your regular shopping and Destiny’s Hope gets a donation. How cool is it when you’re shopping there for a donation using the wish list (https://smile.amazon.com/gp/registry/wishlist/38LRCER6BAOJ2) and you are not only getting the cats the products that they need, but Amazon is donating cash as well! The key is that you have to go to Amazon using the smile.amazon.com or a donation isn’t made. (your faithful webinista changed my default — Amazon is a startup tab for me and now I don’t ever forget to use the correct url). Kiya was adopted from Destiny’s Hope about 2 years ago. We recently received the following from Kiya’s owner and helped her start a GoFundMe page to help with the vet bills. This is a young, much beloved cat who has found a forever home. Any help you can provide to make sure the forever is a very long time would be most appreciated. Kiya has been pretty sick for a couple months now. I’ve been to my vet 3 times so far, and really can’t afford to keep doing lots of tests. Right at the moment, all we know is that she is hypercalcemic. She does not have any tumors or cancer that they can find, but the calcium needs to come down before it effects the other parts of her body (like kidney stones which I can’t afford to have operated on). I am not sure if there is any help you could provide , but I am desperately trying to survive on only $500/month for disability which covers practically none of my bills so debt has already been piling up. Of course my babies are a priority and I will always take care of them before anything else, but this is really, really difficult… I’ve been panicking almost every day. I am so glad I got Kiya from Destiny’s Hope. 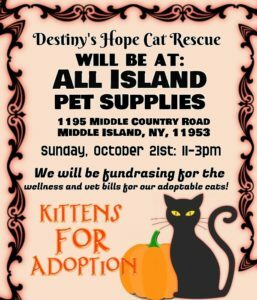 Destiny’s hope is a truly beautiful organization that I believe in whole-heartedly, and recommend to people looking for kitties all the time. Kiya has been a genuine life saver for me time and time again since I adopted her about 2 years ago. She is such a strong emotional support, and one of the most affectionate furrbabies I’ve ever had. SHE NEEDS A SPECIALIST ! SHE NEEDS DIAGNOSTICS! She currently doesn’t have urinary stones and does not have trouble urinating. Please help $5 is all I ask.